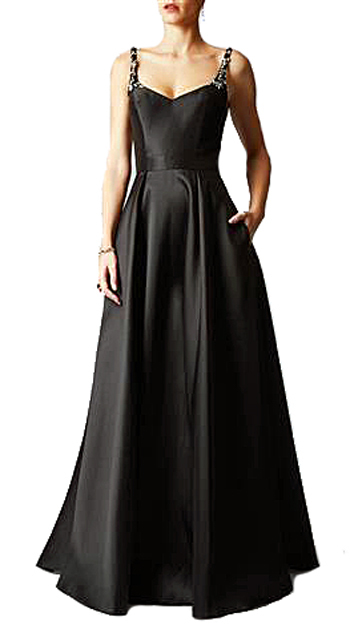 A sculptured ball gown with fitted waist and bodice and side pockets in the full skirt. Feature cut out back finished off with a bow. Lovely shimmering thicker satin fabric. Fitted bra cups so no need for a bra. Beautifully designed and made using quality fabric. To order in size : UK6 and UK8 in Black. Fabric is a thick poly satin, 100% synthetic fabric. Easy to wash and iron.